Bidspirit auction | LESSING, GOTTHOLD EPHRAIM. Natan HaChacham - Nathan der Weise. Ein Dramatisches Gedicht in fünf Aufzügen. 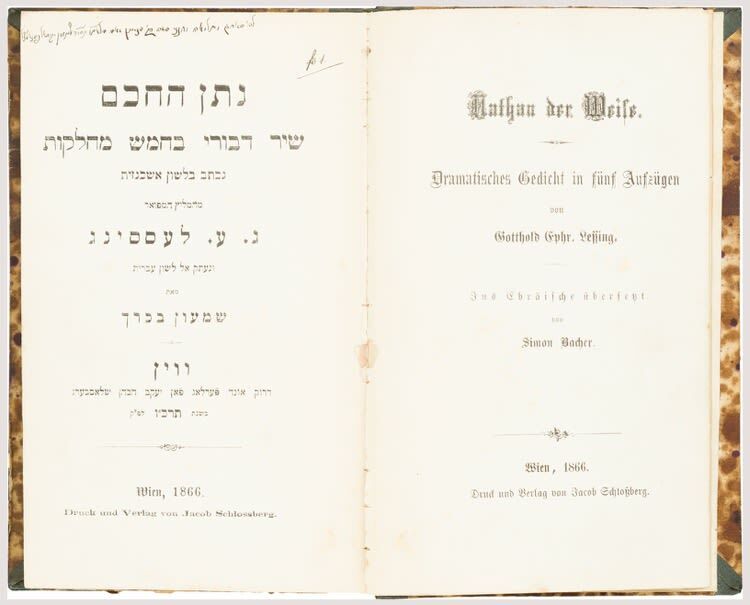 FIRST HEBREW EDITION. Additional German title-page. Translated by Simon Bacher. pp. xiv, (2), 208, (2). Signature on title. Contemporary boards, rubbed. 12mo. One of the outstanding representatives of the German Enlightenment, Lessing was devoted to the principles of religious and social tolerance. Nathan the Wise was Lessing’s drama inspired by his friendship with Moses Mendelssohn. Based upon the parable of the three rings adapted from Boccaccio’s Decameron, the play presents Judaism, Christianity and Islam as the three sons of a benevolent father who has given each an identical ring - although each claim that his ring alone is authentic. Enter the Nathan figure, who calls for an understanding of mutual belief between the three religions, thus echoing the aspirations of the Enlightenment: Tolerance, brotherhood and love of all humanity.